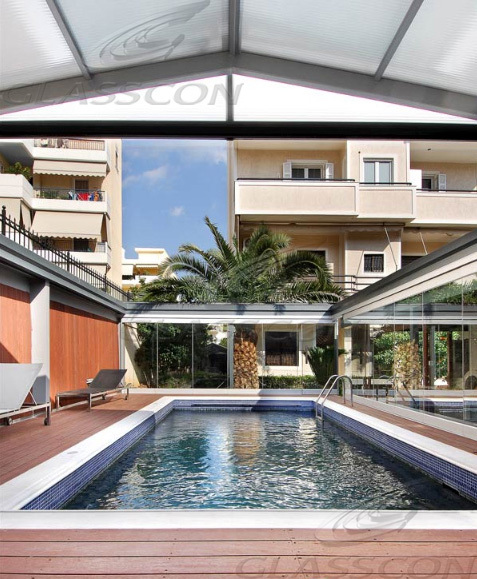 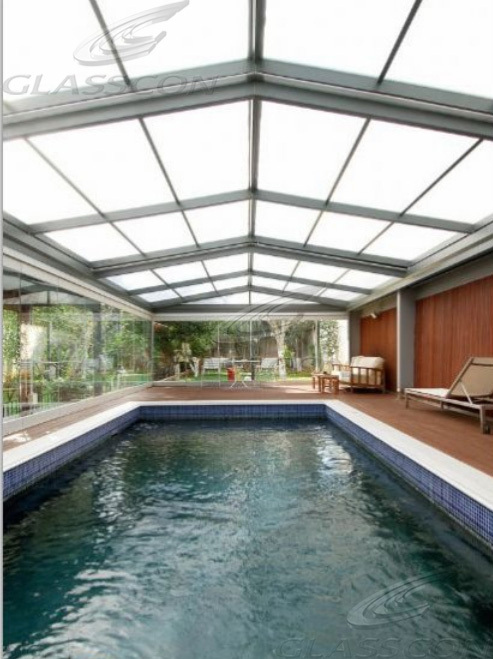 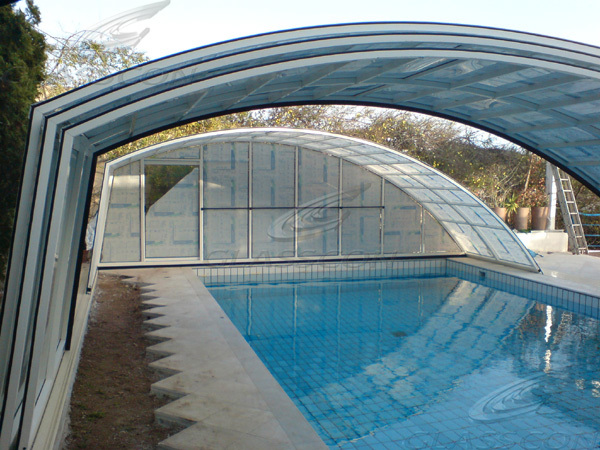 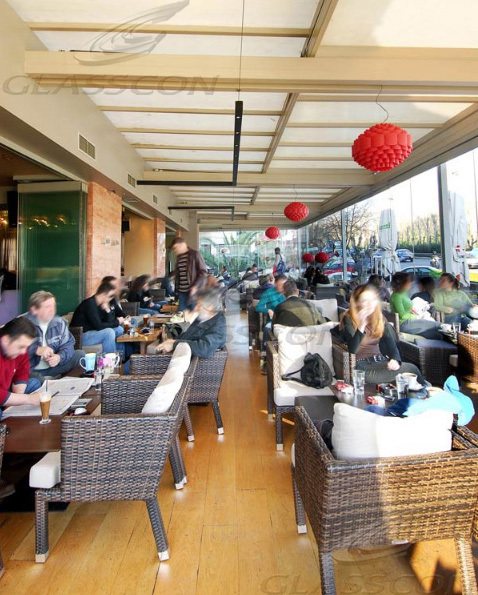 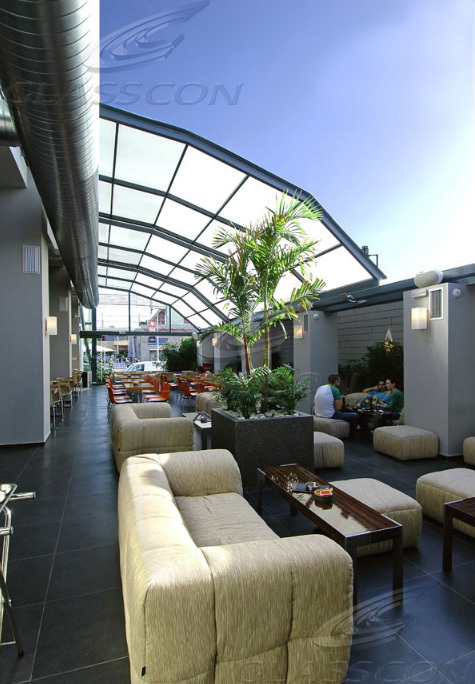 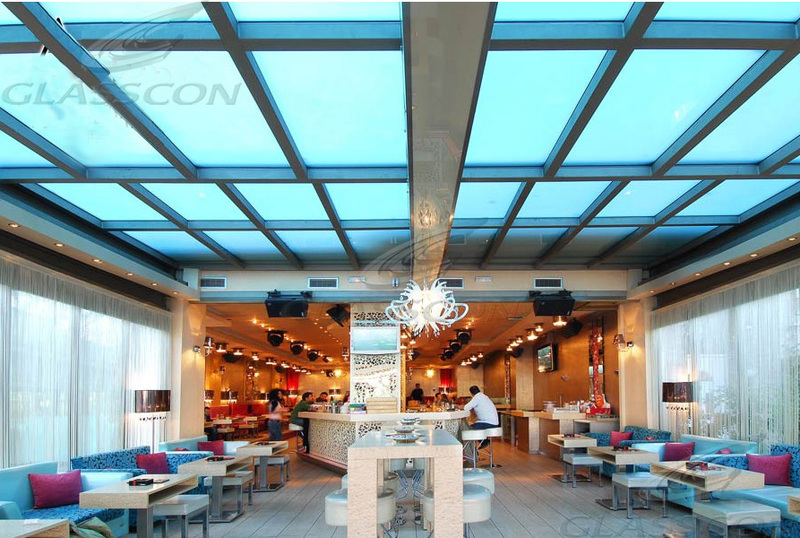 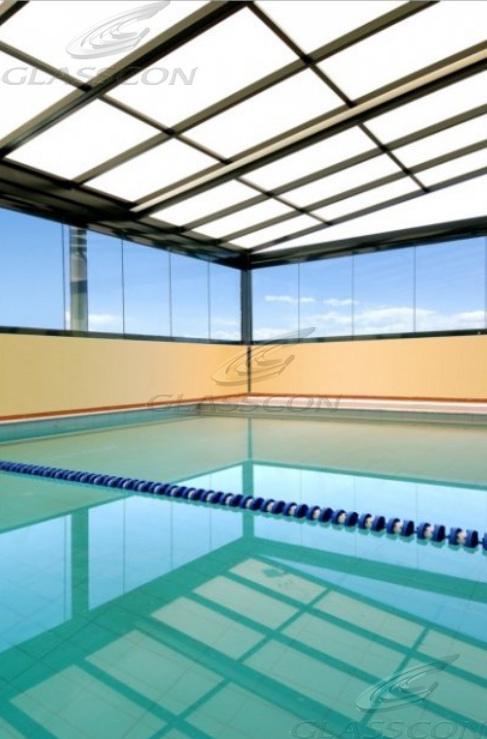 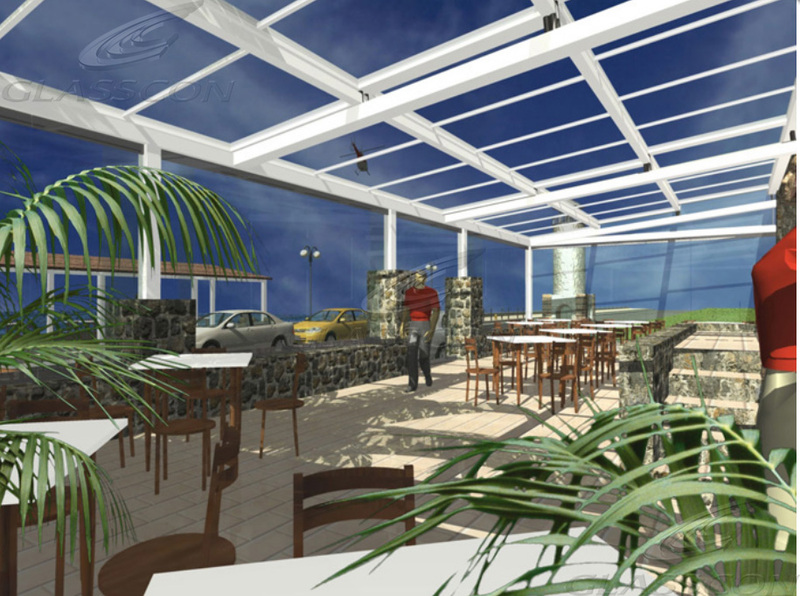 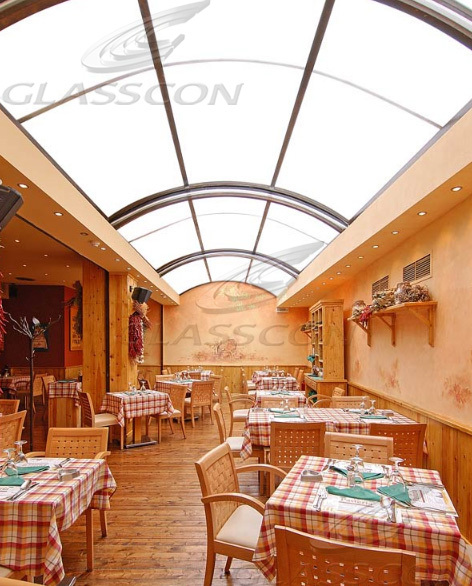 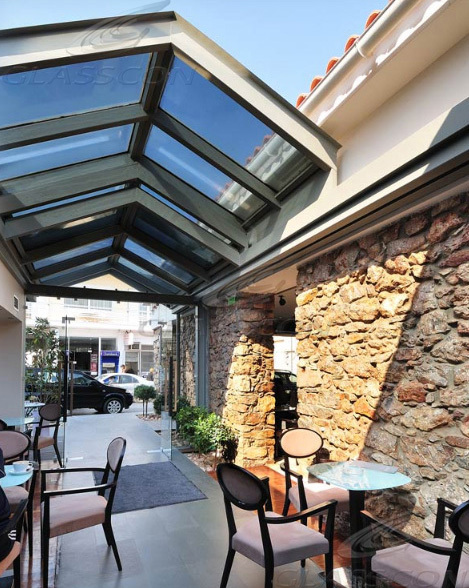 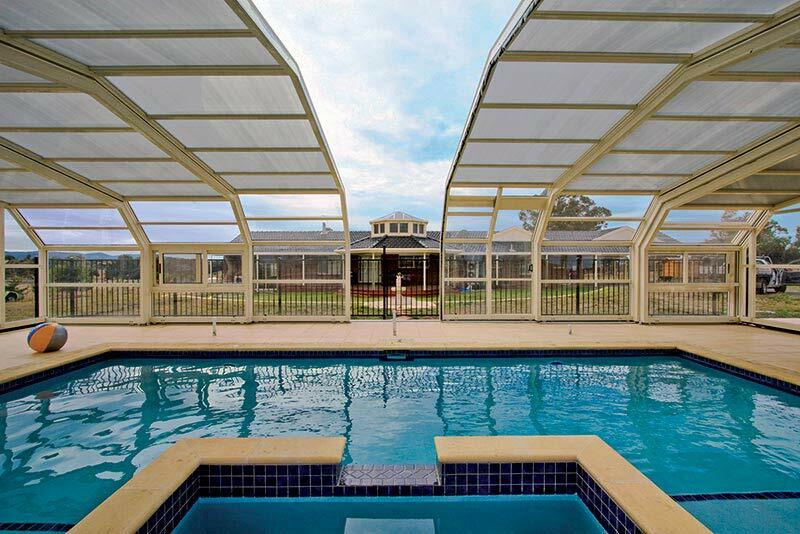 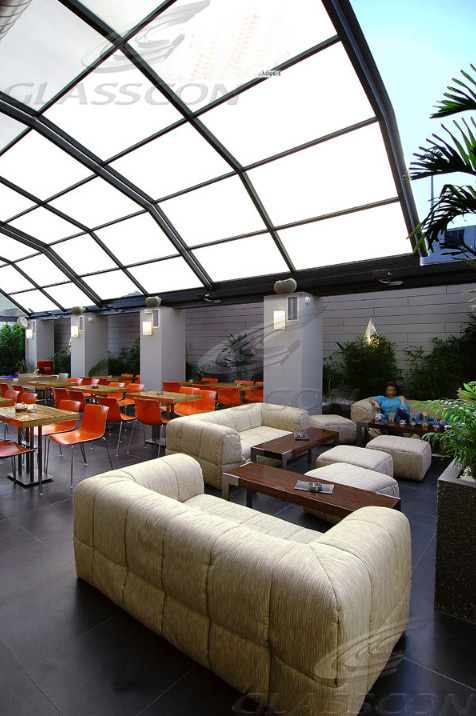 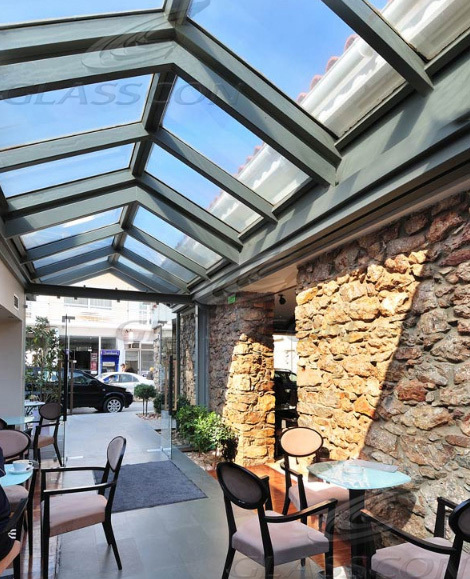 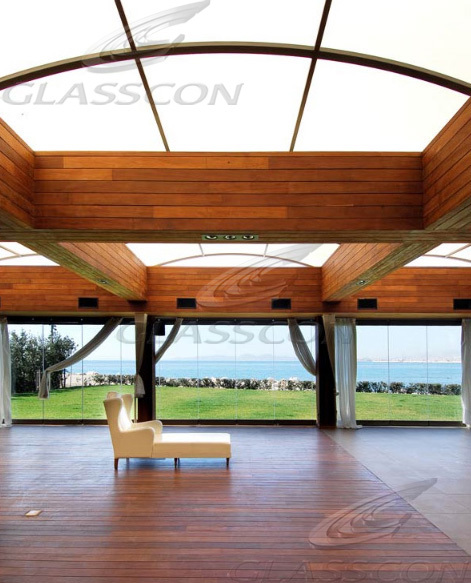 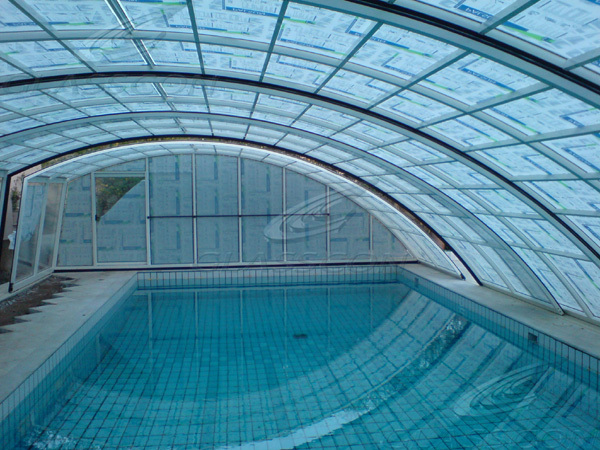 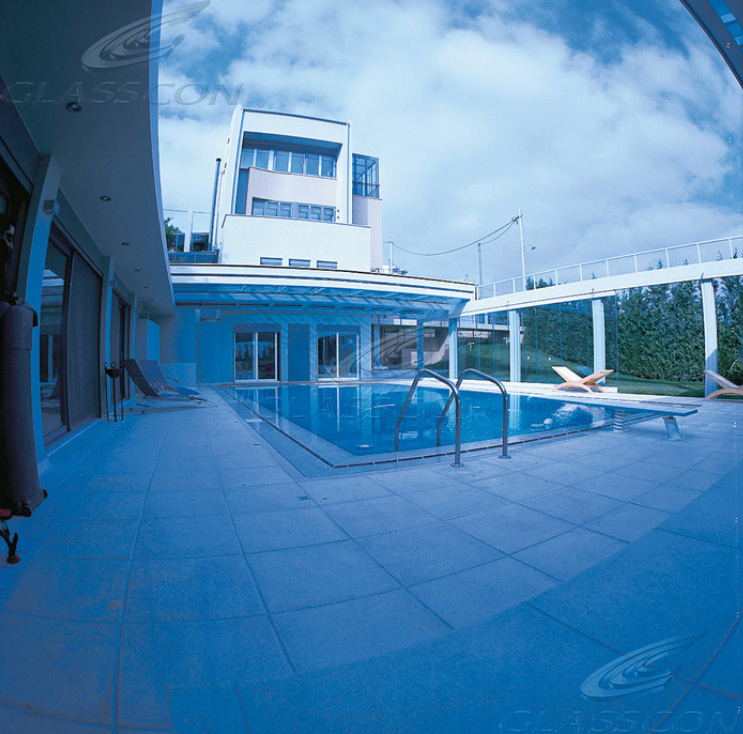 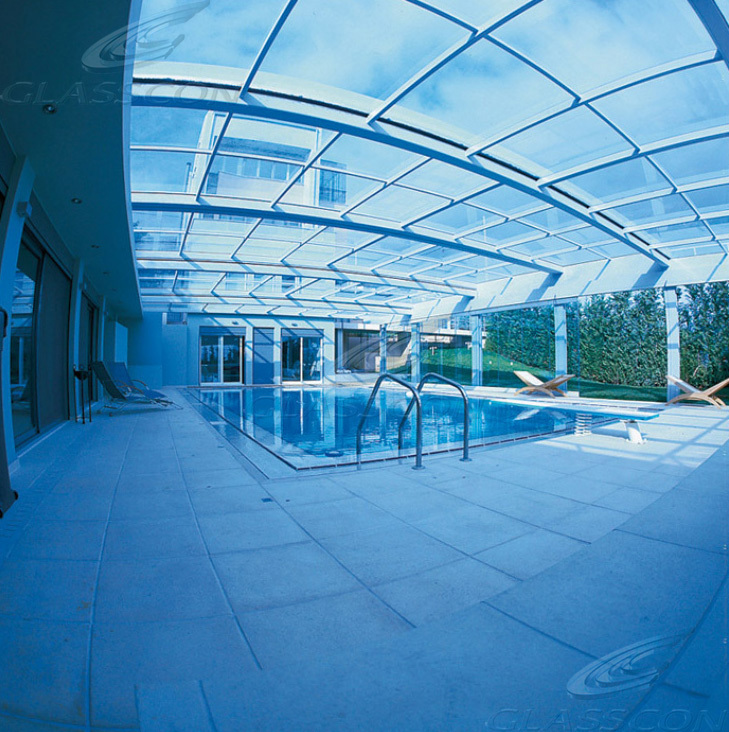 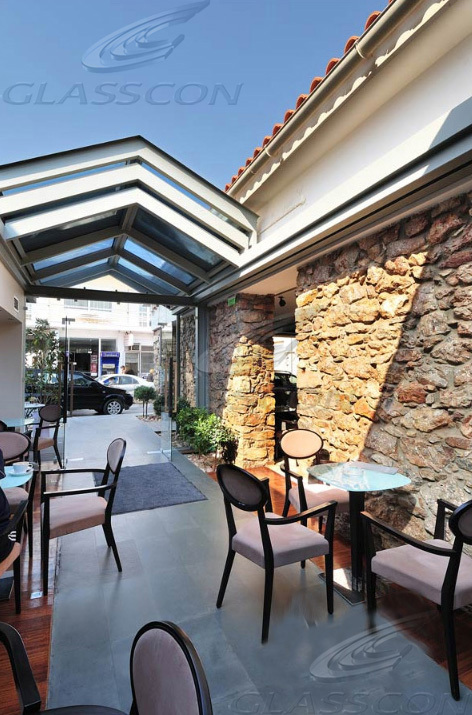 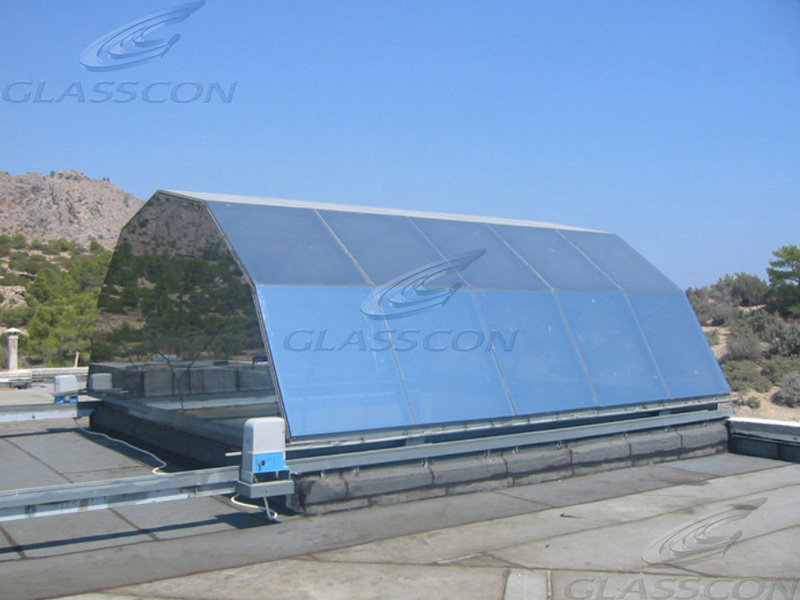 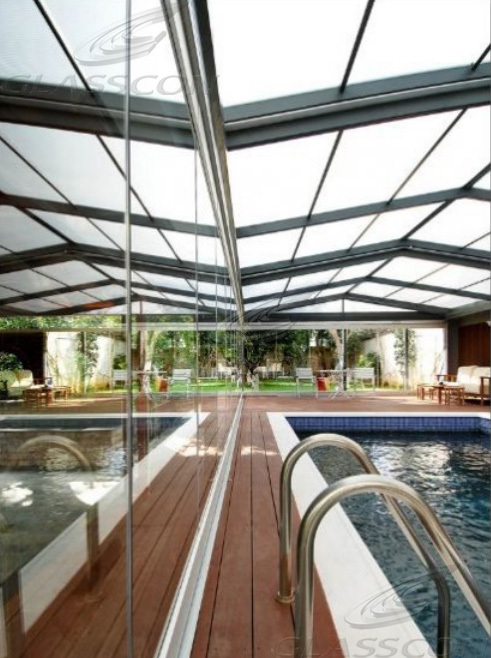 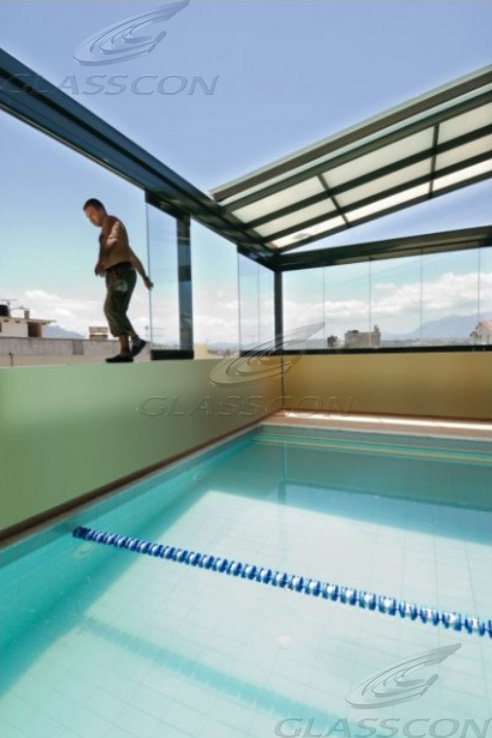 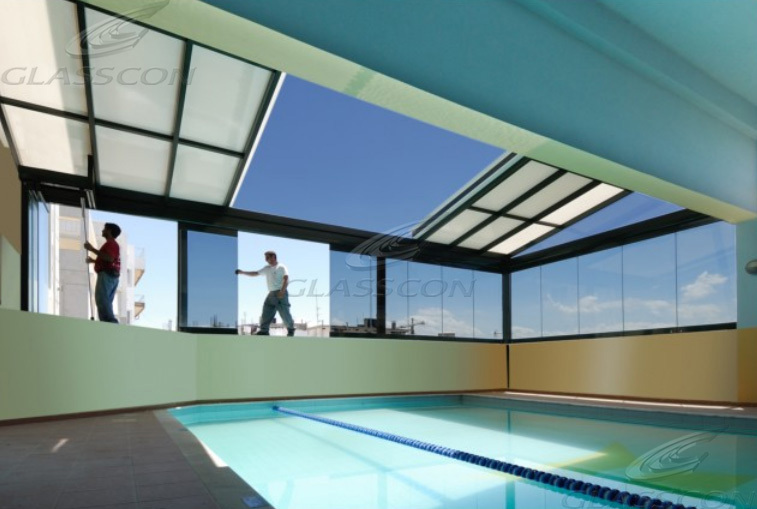 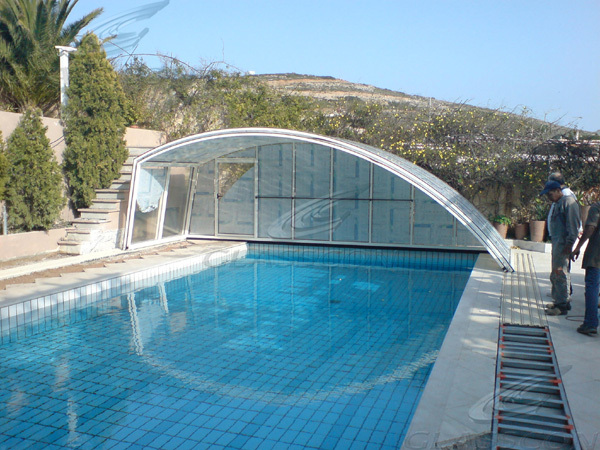 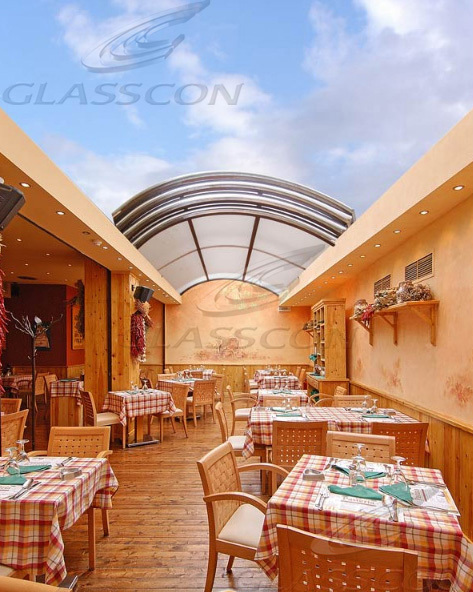 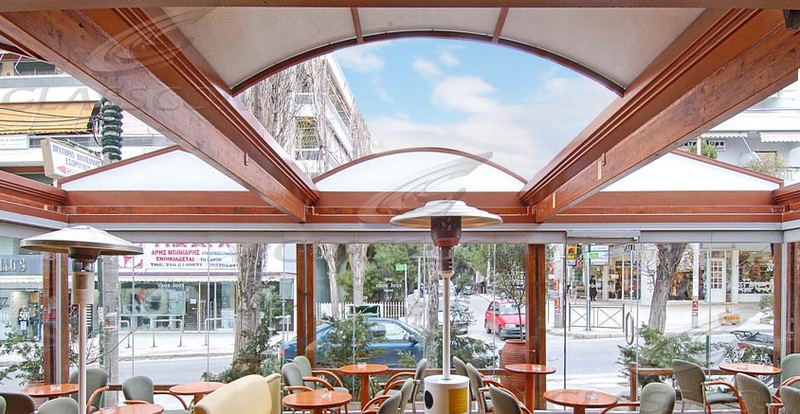 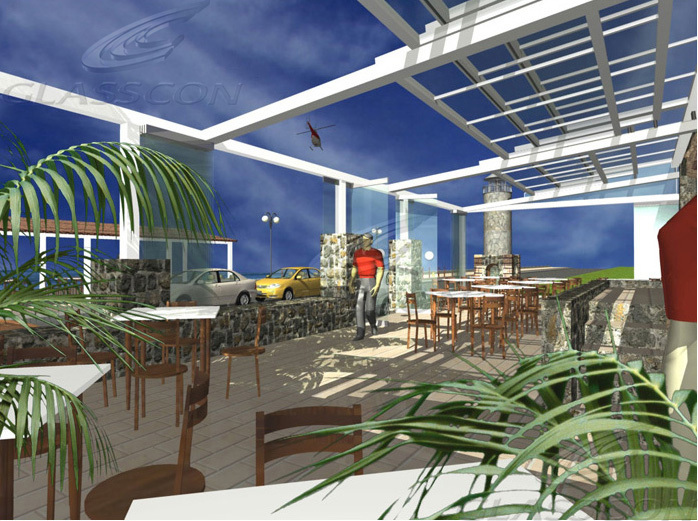 GLASSCON offers high-quality automated Retractable Enclosures for Pools, Restaurants, Wintergardens, Cafes etc. 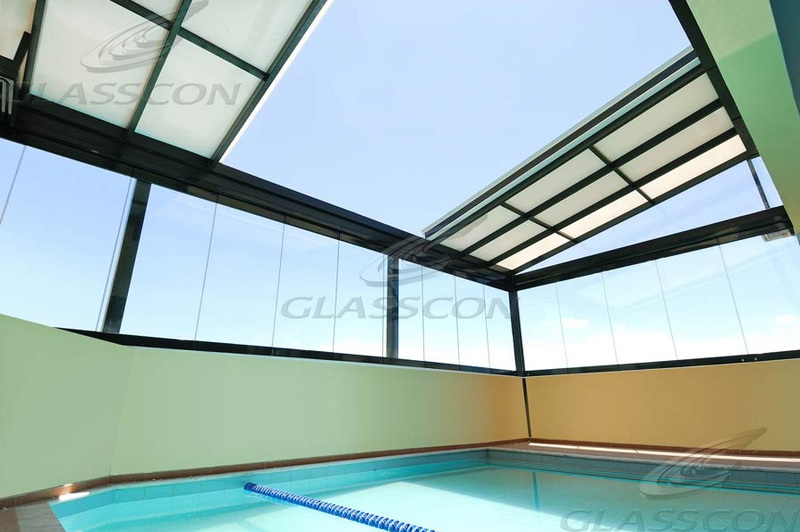 The system of “Glasscon Freestanding Retractable Enclosures” consists of electric sliding glass panels which are extremely easy to operate. 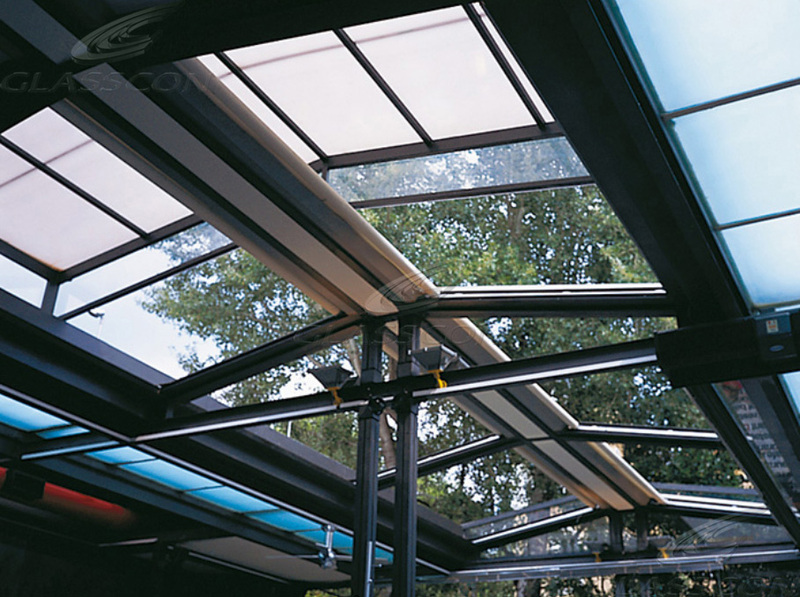 Pushing a button, someone can easily open or close the retractable roof, according to its favor. 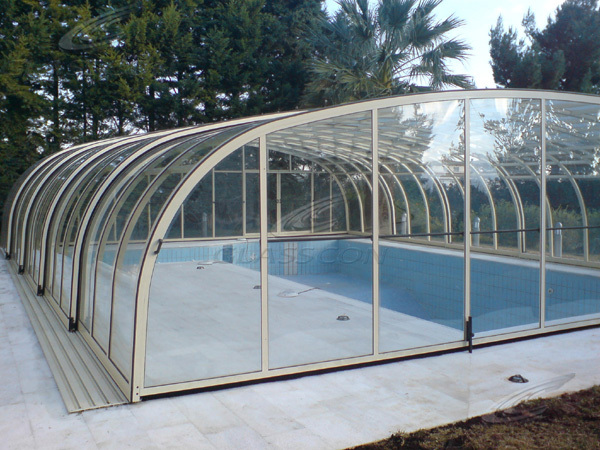 Thanks to the use of durable materials, such as Aluminum and Glass, the end product is extremely robust and highly resistant to outside weather conditions. 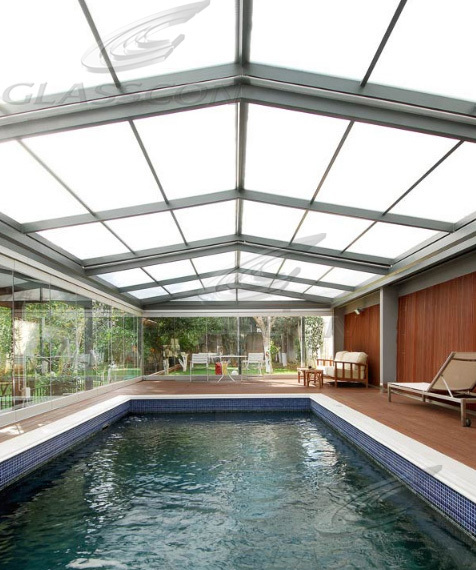 The sliding glass panels are made out of (DGU) thermal insulated glass and are attached via structural silicone bonding on aluminum frames. 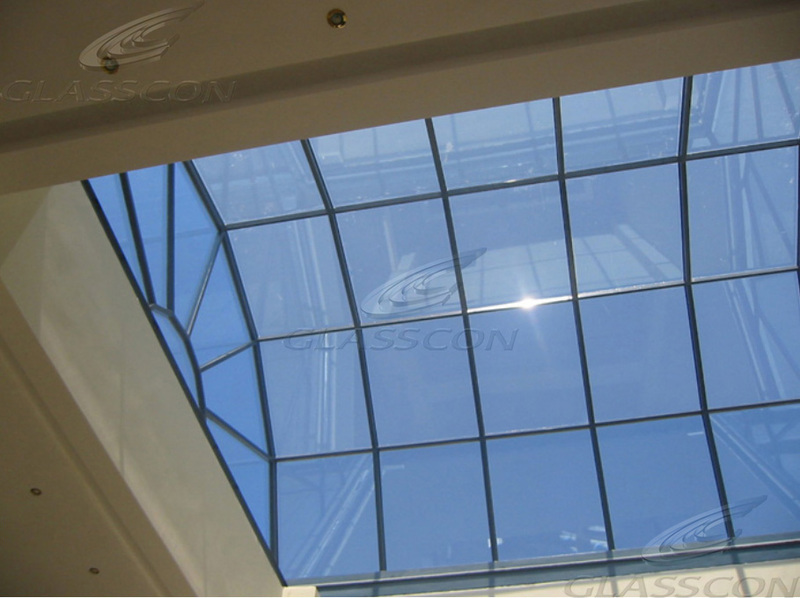 While opening, each panel slips below the next one in such a way, so that the 3/4 of the roof remain finally uncovered. 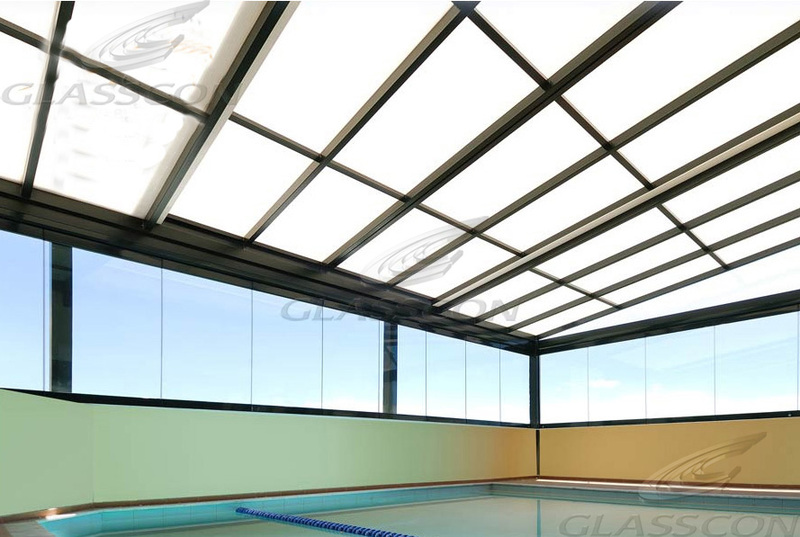 The upper last panel - on each row - remains fixed and the rest panels slip below. 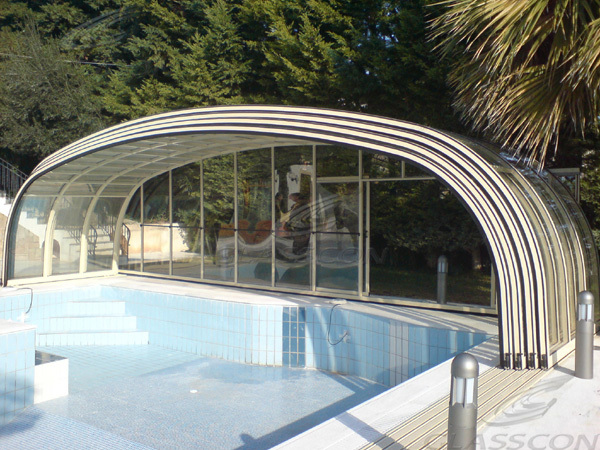 The aluminium profiles are colored in RAL according to client specifications. 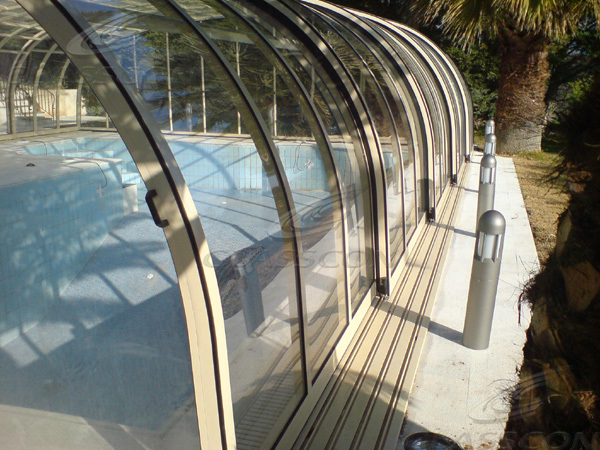 As standard glazing, DGU Double Glazing units are used. 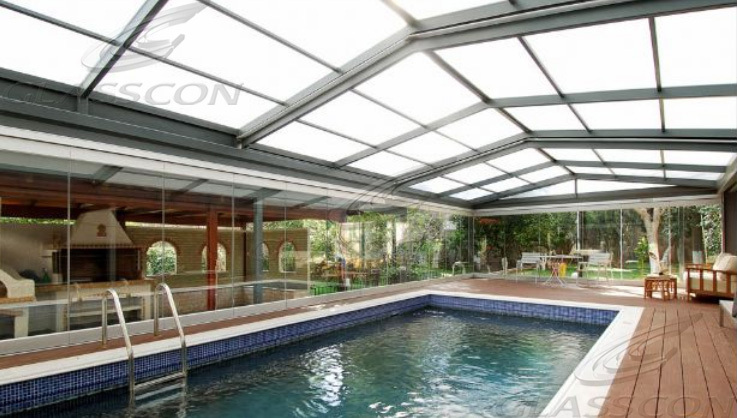 The structural system is made of custom designed aluminium extrusion while all hardware and fixings parts are stainless steel or similar non corrosive material. 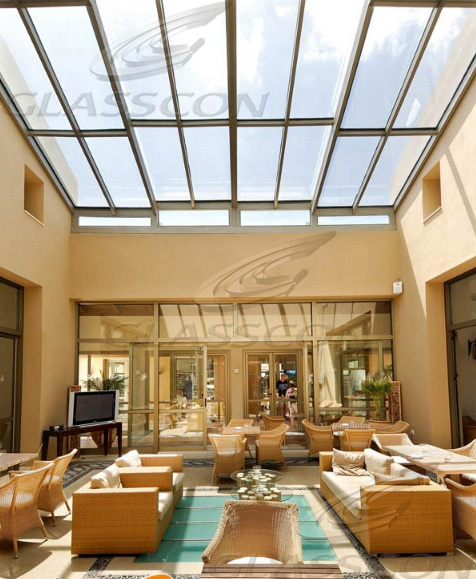 The mullions have an integrated condensate channel collection system, designed to divert condensation and moisture to the exterior and the hinges, brackets, screws are not exposed and no part of the mechanical system is visible. 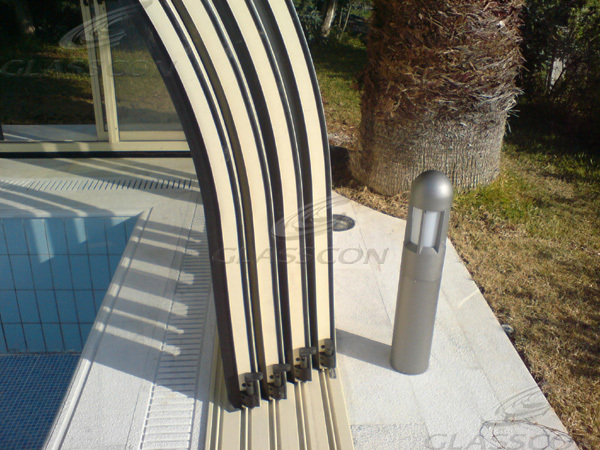 Rails are made of aluminium, equipped with aluminium stoppers and the module wheels are made of polyamide or better material to ensure strength and durability. 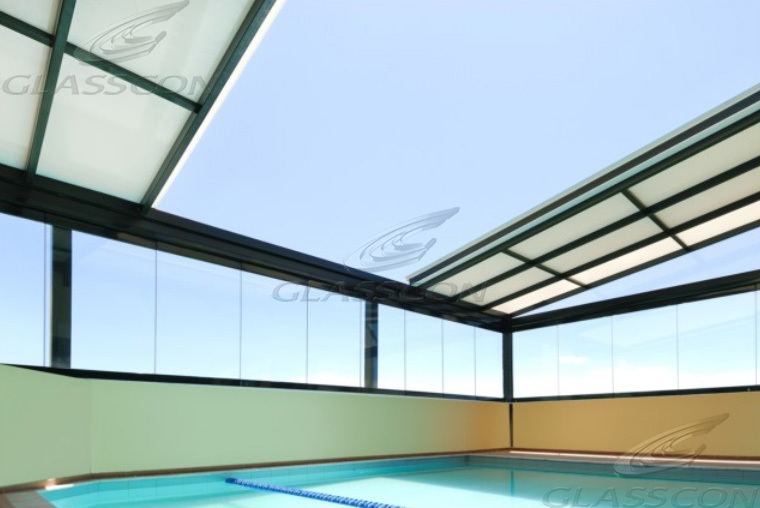 The glass panels are structurally attached via silicon to the aluminium frames to ensure waterproofing, increase thermal insulation and prevent dust. 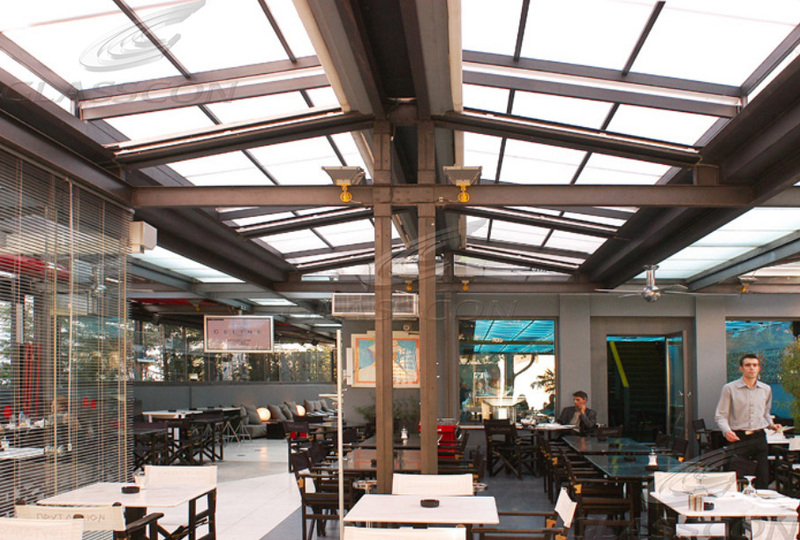 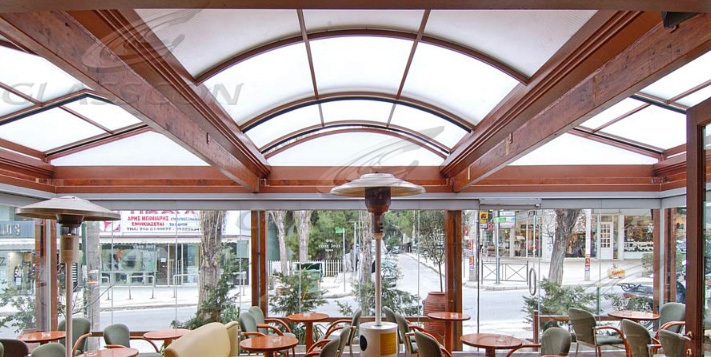 If required and for even more safety, either ANTIVANDAL SAFETY, BULLET PROOF THERMAL INSULATED DGU glass panes can be applied or alternatively architectural mesh can be placed over the glass sunroof, made of ARCHITECTURAL STAINLESS MESH.